← My new Book “Encounters with the World’s Religions” now in print! Cov Davis held the hand of her three-year-old son, as she balanced the weight of her two-year-old daughter on her hips, swaying slightly to calm the restless child. Her beaded moccasins crunched coarse, dry sand as she gazed at the entrance hole to the Hopi kiva at Walpi Mesa, in northern Arizona. Standing here on this mesa seemed like being on a space ship hovering over earth. The hazy October sun set behind the San Francisco Peaks to the west; rain poured out of a purple hued thundercloud to the south. Jagged lightening flashed toward earth and the shock wave of thunder frightened the children, as they clung to their protective mother. Cov sensed an invisible barrier between herself and the kiva, as this sacred space was reserved only for the Eagle Clan’s private ceremonies. However, that night was different. Her husband, Father John Davis, Episcopal priest who had ministered to the Navajo and Hopi for the past twelve years, was departing the reservation for a new assignment in California. The night descended upon the mesa. A luminescent glow emanated out of the entrance hole to the kiva. “Come over here,” Father John whispered to Cov, as he emerged from the ladder into the Kiva. Many years later, Cov would recall what happened next. 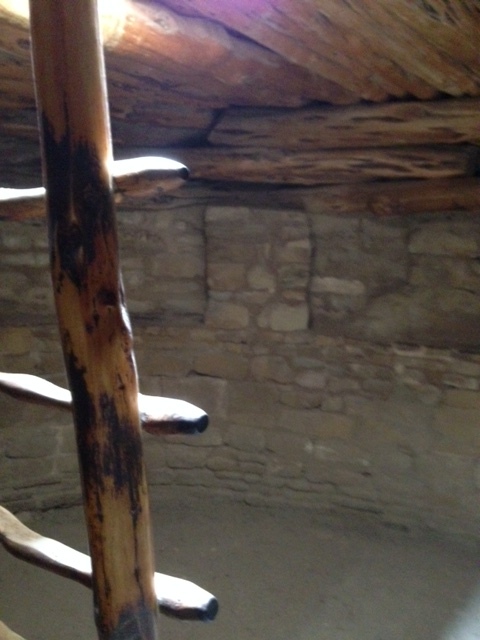 With John’s help she transported the children down the sturdy cottonwood ladder into the kiva. A small fire of pinyon pine burned in a corner, and through some ancient engineering the smoke went out somewhere and was not bothersome. Benches carved into the sides of the earthen hole were filled with men from the village. Some faces reflected deep altered states. Others looked to her in greeting, slight smiles, and nods. No one was speaking, as sound amplified in the enclosed space. As Cov looked around at the men seated around her, memories of past events connecting her to each person passed through her mind. Precious friends. Something within her ached with love, affection and the beginning of grief. Thunder boomed again in the distance. Three men began to beat a drum in alternating cadence. Soft humming followed. The humming became words to chants and the sound enfolded Cov and the children. She looked at the faces of her son and daughter, worried again that they might cry or make other disturbing sounds. But the soft rhythm of the drumming and chanting filled the space with the hint of spicy pinyon smoke and the eyes of the children widened with enchantment and wonder. As Cov remembers that last night on Walpi mesa, she thinks the family was in the kiva for several hours, and the enchanted state of her children lasted the whole time. The family left the kiva and the Reservation with blessings from the people as they continued west toward Orange County, California. Mable Dodge Luhan, in “Edge of Taos Desert,” shares another story of a kiva experience. There was a white man who was brought into the tribal community because the Indians were fond of him, to such an extent that he was allowed to attend their ceremonies if he was blindfolded. He remembers that once he was taken down into the kiva ceremonial space. They removed the blindfold from the man, he looked around, and everything in the kiva looked as it was when he first entered. October 2014, Janice, I, and our adult disabled son Erik walk a winding paved road from a parking lot at Mesa Verde National Park down steep inclines toward Spruce Tree House. Residual raindrops from a passing thunderstorm drip on us from juniper and pinyon pine. At a wide turn on this path, we pause to view a huge rocky alcove within which are set the ruins of this Ancestral Pueblo village, occupied between CE 1200 and 1280. We continue walking toward the sound of a waterfall and find the ancient seep water source which sustained the settlement in this desert mountain landscape. We come close enough to touch the walls of the impressive ruins. Two kiva courtyards spread out to the left and right, each with a ladder inviting visits to reconstructed kiva sacred space. As the early inhabitants once did, I climbed down a cottonwood ladder and stepped back to the recessed walls. Using a National Park Service booklet for orientation, I could see that above me, cribbed wooden roof beams rested on six supporting pillars/pilasters. 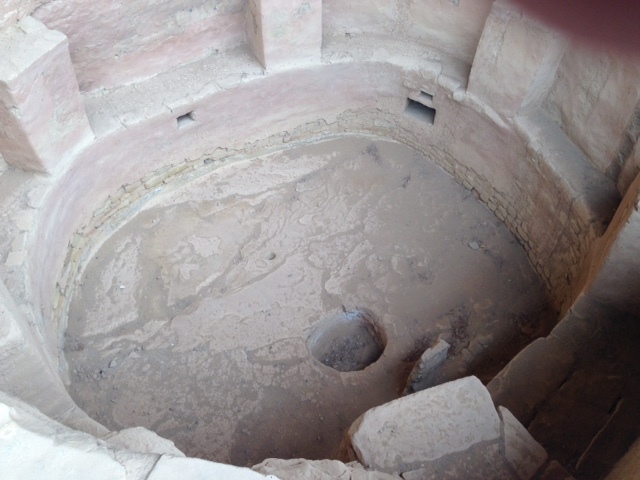 Traditionally, at the center of the kiva is a fire pit next to a stone deflector. I can see a ventilator opening in the wall and something that looks like a chimney that must have pulled in outside air. Smoke escaped through the ladder entrance hole. A small circular hole is the sipapu, believed by Pueblo people to be a vestigage into the former world. There are niches in the walls for storage and space for a sacred altar, where ceremonial masks and sacred corn could be placed. As I sat on one of the inset stone benches within this kiva, I was alone. However, my mind went quickly back to my memory of Cov’s visit to the Hopi kiva with her children. I sit on a recessed stone bench in the kiva. It is late afternoon, near closing time. I am alone. Janice and Erik wait for me in the ruins above. Soft orange beams of sunlight shine down the ladder entrance hole. This is not an historic ruin, this is ancient holy ground, a well prayed in place. The prayer people who lived here died one-thousand years ago, but pueblo people today would honor their presence. I contemplate the three narratives I have shared with you. One is a memory from an Anglo woman who had a powerful experience as a spiritual guest with her family in the Walpi Hopi kiva. One is a story told by Mabel Luhan, as transplanted Eastern artist, who became enchanted with the people at Taos Pueblo. Her narrative sounds like a sensational event to add to a collection of spiritual experiences. 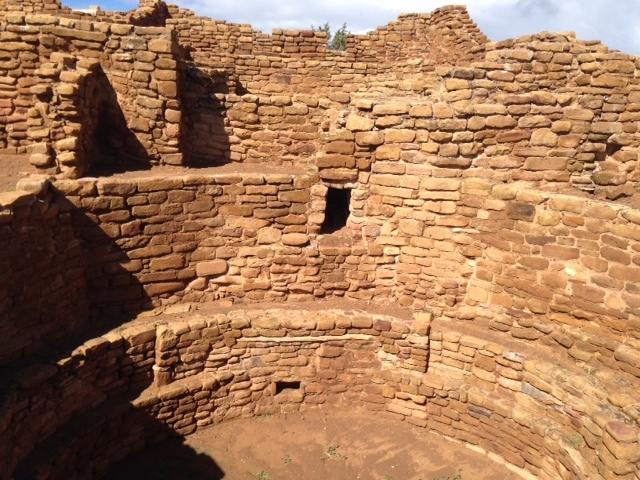 The third narrative comes from the National Park Service, technical information gleaned from archaeologists to help the visitor understand the physical layout of the kiva. However, this is still holy ground, mysterious space where the ancient ones communed with the Holy. Whose narrative is being told in this place? Anecdotes from Anglo friends, anthropologists, government caretakers, or vestiges of the people who once lived here? French Philosopher Paul Ricoeur contends that the narrative of this holy ground kiva includes history but also “fiction,” what we may call “myths,” because in traditional cultures myth is actualized story. Here is the narrative of the ancient ones who lived here. The Creator made the First World. Spider Woman and Sotuknang instructed the people to honor with gratitude the Creator. Fire laid waste to this First World, because the people forgot the creator. However, there was a remnant of the people who remembered the creator and they went underground to seek refuge with the Ant People. In time, the creator permitted the people to come up from the underworld into a beautiful new world. However, connection between the animals and the people had been lost and again the people forgot the Creator. Ice and snow destroyed this world. Another cycle of reemergence and creation of a Third World, and forgetting the creator resulted in destruction by flood. Finally, the gods guided the people to emerge into a recreated Fourth World. The kiva represents the memory of this narrative with the sipapuni, the portal through which the ancestors entered and reentered the four worlds. To what narrative have you given your heart? Sitting in quiet contemplation in the kiva, standing in the desert as morning light breaks out of Monument Valley to the east, kneeling before the Blessed Sacrament at my parish, I embrace the narrative of my life, which includes remembering the Creator in gratitude for all the gifts and graces in those times when I was at the end of my resources and running on empty. Being in sacred space evokes deep gratitude from me. Spruce Tree House, Ray Barnett and Linda Martin, Mesa Verde Museum Association, 2014. Landscapes of the Sacred: Geography and Narrative in American Spirituality, Belden Lane. Baltimore: Johns Hopkins Press, 2002. Spaces for the Sacred: Place, Memory, and Identity, Phillip Sheldrake. Baltimore: Johns Hopkins Press, 2001. Believing in Place: A Spiritual Geography of the Great Basin, Richard V. Francaviglia. Reno: University of Nevada Press, 2003. Edge of Taos Desert: An Escape to Reality, Mabel Dodge Luhan. Albuquerque: University of New Mexico Press, 1999. Thank you for the reminder; prayers for gratitude and guidance are important.